Help – I can’t get Legal Aid to fund my divorce? Since April the 1st of this year (2013)it has become impossible for many people to obtain legal aid funding in respect of their divorce (or dissolution of civil partnership) and associated financial matters. 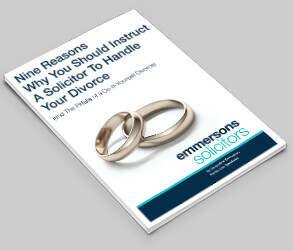 Emmersons Solicitors Specialist Family Law team frequently deal with cases where one party has substantial assets in their sole name with the other having very little. If one person is the carer for the children they may have very little or no income. If the relationship ends then the non - working party will find themselves at the mercy of the other for maintenance payments and a proper financial settlement. With the near-extinction of legal aid the Government has introduced a law allowing one partner to make an application for a Legal Services Order. This is an application for sufficient funds from the paying party to fund part or all of the legal process. The court must be satisfied that the applicant cannot obtain funding from elsewhere and cannot obtain a loan. Consider Michelle and Steve as an example. Steve earns a lot of money and has an excellent pension package. However, there is not much equity in the family home as the couple had debts and the house was re-mortgaged to clear them. Michelle does not work and cares for the three children of the family. In this case it is unlikely that Michelle would be able to source a loan from a bank or anywhere else. Steve is refusing to pay enough maintenance to allow Michelle to run the household and feed and clothe the children. She could therefore apply to the court for monies to fund her legal costs. The judge would have to be sure that Steve could afford to pay these. A judge can order a lump sum payment to cover legal costs or monthly or weekly amounts. An order can be made for the sale of assets to fund this, including houses or commercial property. The order must not put the paying party at such a disadvantage that they cannot fund their own legal fees. An order must not cause undue hardship to the paying party. Therefore it is possible that a luxury car could be sold and a cheaper car purchased. An endowment policy held in the sole name of the paying party could be encashed. It is highly likely that the threat of an application to the court will result in the richer party making money available to their spouse or partner so that they can fund their legal fees. The courts expect both parties to be able to have what is known as parity of arms. Would anyone want to risk the forced sale of their £40,000 BMW so that they could take the bus instead? It’s not as bad as it seems, don’t panic, seek legal help instead.